There have been almost daily protests that have left several dead. CARACAS — Carnage continued to rage over the weekend in Venezuela as the death toll rose to at least 60 people in continuing anti-government protests waged almost daily since the end of March. Attorney General Luisa Ortega has blamed military police for hundreds of injuries, while many more have been incarcerated. On Friday, riot police fired tear gas and water cannon to stop protesters from marching on a key military installation to try to sway the support of the armed forces, a key pillar of the government of socialist President Nicolas Maduro. 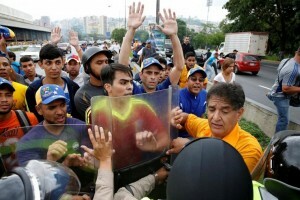 Retired military personnel joined demonstrators who attempted to reach the Los Proceres complex, which houses the defence ministry and lies close to a major military base in Caracas. The protest was aimed at “demanding that the armed forces lower their weapons and not be complicit in the dictatorship,” according to Freddy Guevara, an opposition leader who is vice president of parliament, the only branch of government the opposition controls. But despite the opposition’s calls for the military to abandon Maduro, the high command has retained its public support for him so far. The president has launched steps to change the constitution in response to the crisis. His opponents say that is a bid to dodge elections and cling to power. They brand the socialist president a dictator, blaming him for economic turmoil and critical shortages of food and medicine. Maduro is resisting their calls for early elections, saying the opposition and the United States are plotting a coup against him.